Pain (initially at night/rest), fever, chills, draining sinus tracts. Symptoms may be mild and difficult to differentiate between asceptic loosening, instability, etc. Xrays: evaluate for periosteal reaction, scattered foci of osteolysis, bone resoprtion, implant wear, progressive radiolucencies, osteopenia, . Metal-onmetal articulation: excellent wear rates in vitro. Painful metal-on-metal THA: ESR, CRP, and serum cobalt and chromium ion levels, MARS MRI(fluid collections, pseudotumors, and abductor mechanism destruction). Hip arthrocentesis indicated if CRP is elevated to eval for concomitant infection. Manual cell count and differential required do to potential falsely elevated cell counts with automated systems. Elevated serum metal ions and abductor dysfunction, suggests poor bearing function and adverse local tissue reaction (ALTR). Cobalt disproportionately higher than chromium suggests corrosive changes at the prosthetic femoral neck (trunnionosis). Instability is the most common complication following revision of failed metal-on-metal hip replacements. Generally do not remove a stable cementless femoral stem. If revising for metalosis or there is some damage to the taper use a titanium taper sleeve with a ceramic ball. Use of a ceramic head on a previously used trunnion risks fracture of the ceramic head. -Type 1: minimla metaphyseal involvement and adequate cancellous bone. RX: 6in long primary fully porous-coated stem. -Type 2: metaphyseal damage with a minimally involved diaphysis. RX: 6in long primary fully porous-coated stem. -Type 3A: metadiaphyseal damage with 4cm of reliable cortex proximal to the isthmus. RX: 7-10in long revision fully porous-coated stem. -Type 3B: metadiaphyseal damage with 4cm of reliable cortex distal to the isthmus. RX: 7-10in long revision fully porous-coated stem. -Type 4: extensive metadiaphyseal and thin ballooned cortices with widened canals precluding reliable fixation. RX: impaction grafting, modular tapered stems, allorgraft prosthetic composites, megaprosthesis. -Type 1: rim and columns intact with more than 50% of the cup in contact with host bone. RX: allograft filling of contained defects with press-fit cup supplemented with screws. -Type 2A: anterior and posterior columns intact, partial loss of the superomedial wall. RX: allograft filling of contained defects with press-fit cup supplemented with screws. -Type 2A: anterior and posterior columns intact, partial loss of the superolateral wall. RX: allograft filling of contained defects with press-fit cup supplemented with screws. -Type 2A: anterior and posterior columns intact, partial loss of the medial wall. RX: allograft filling of contained defects with press-fit cup supplemented with screws. -Type 3A: severe bone loss involving the acetabular walls and pelvic columns. Rx: bulk allograft with antiprotrusio cages or porous tantalum metal augmentations. (Sporer SM, J Arthroplasty 2006;21S:83). 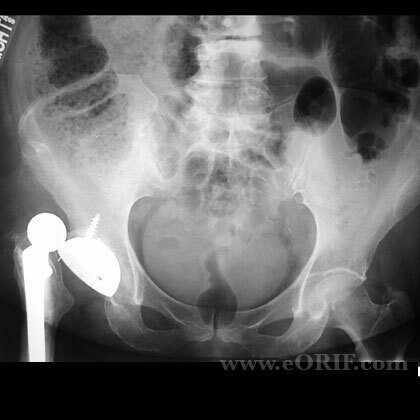 -Type 3B: severe bone loss involving the acetabular walls and pelvic columns with pelvic discontinuity. Rx: bulk allograft with antiprotrusio cages or porous tantalum metal augmentations. (Sporer SM, J Arthroplasty 2006;21S:87). Hip Antibiotic Spacers: Biomet Stage One; Exatech hip antibiotic spacer. Periprosthetic infection: 0.95% (Mahomed NN, JBJS 2003;85A:27). 4.1% mechanical failure rate at 14yr follow-up for fully porous-coated femoral stems (Weeden SH, J Arthroplasty 2002;17S:134). Kwon YM, Jacobs JJ, MacDonald SJ, Potter HG, Fehring TK, Lombardi AV. Evidence-based understanding of management perils for metal-on-metal hip arthroplasty patients. J Arthroplasty. 2012 Sep;27(8 Suppl):20-5.